Breathalyzers... one of the few devices that are both lots of fun and totally practical. 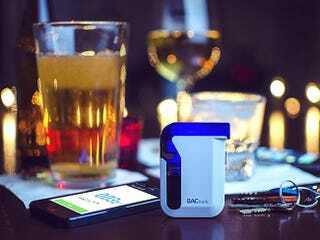 BACtrack's Mobile Breathalyzer is one of the best consumer breathalyzers out there. It tells you your BAC via the BACtrack app so you know if you're sober enough to take the wheel. Right now, Gizmodo can grab one at a 57% discount. The BACtrack is small enough to fit in your pocket, but is as accurate as the breathalyzers used by law enforcement. You simply blow into the mouthpiece and your reading pops up on your phone (iOS or Android) via the BACtrack app. It can calculate when your BAC will return to 0.00% so you can plan accordingly. It's a no-brainer to have this around, so grab yours at a reduced price of 57% off below. Shipping is free to the Continental US, and just $3 more to Canada. It comes with a 1 year manufacturer's warranty in case of damages or defects. Hit the link below for more info and grab yours today.